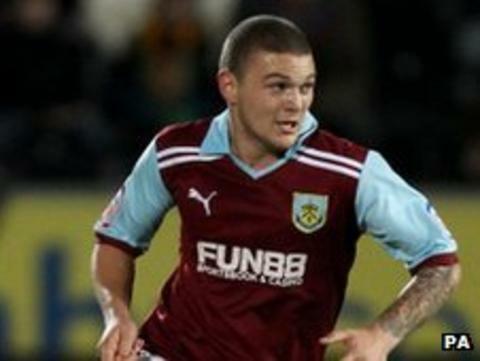 Burnley have completed the permanent signing of defender Kieran Trippier from Manchester City. The 21-year-old has agreed a three-and-a-half-year contract with the Championship side. "He has been a really huge part of our team, how we have played this year," manager Eddie Howe told the official club website. Trippier, who has made 25 appearances this season, joined the Clarets on an initial season long loan in the summer. Howe added: "He has just got better and better and I can't speak highly enough of him as a person and as a footballer. "We are extremely grateful to Manchester City for trusting us and allowing Kieran to come here in the first place. "In the majority of cases, whenever we take loan players it's with a view to taking them permanently because I think that's the best way to use the loan system. "The only debate was whether Manchester City were prepared to let him go. That was always going to be a sticking point, so we are absolutely delighted to get him." Trippier will be a live studio guest on BBC Radio Lancashire on Wednesday from 1800 GMT.